Champion's Beast 5000 psi Multi-Tool eliminates the need for hot swapping tools while in use, and effectively gives the users two tools in one. In addition to the space savings, safety features and value found in our BEAST Multi-Tool, this animal generates a maximum cutting force of 294,000 lbs, which is a minimum of 35% more cutting force than any other 5,000 psi hydraulic tool on the market today. The BEAST line offers the widest cutter opening in the industry at almost 11 inches! 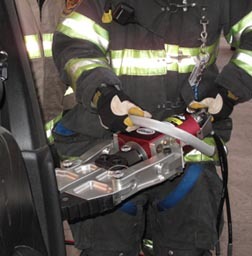 Our patented laminated cutting blades with internal safety restraints are designed to enable the Beast Multi-Tool to overcome the metals found in today's toughest vehicles. When used as a full-size spreader, the Beast boasts a spreading width of 28”, with 16” of parallel travel. The Beast Multi-Tool can be changed from a full-size cutter to a full-size spreader in seconds by pulling 3 attachment pins and changing heads.